Don't have time in class to dedicate to self-reflection or to set goals with your students? That's how I felt this week. We just took a unit test, which I usually like to have a more extensive reflection on their progress, however, with Spring Break coming up, time was a bit tight this week. 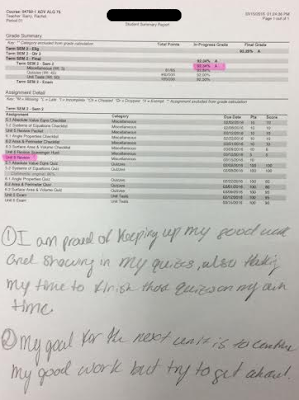 I did wanted to provide students with an outlet to reflect on their accomplishments and to set goals to achieve once they come back, so I created a quick warm-up to accomplish some level of reflection and set a goal. For this warm-up, I handed out grade reports to students. 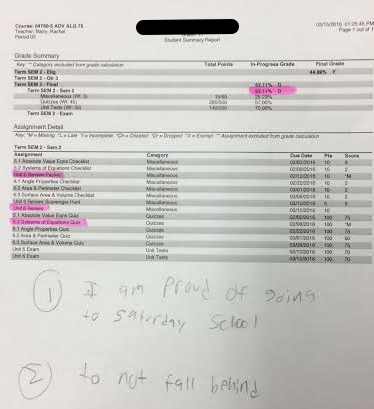 On the grade report, I highlighted any missing assignments or assessments. For some reason, getting a paper copy seems to bring about a different level of significance than just looking at the app on their iPad. 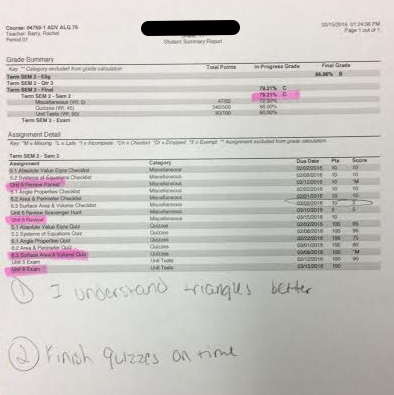 Students took note of any assignments they should be working on over break, as well as which assessments they should take before Spring Break starts. 1) What is one thing you are proud of throughout Unit 6? 2) What is one goal you have for Unit 7? This whole process took about 5-7 minutes, which is the normal length of warm-ups in my class, and we were still able to keep with the rest of the lesson planned for class. Later during the period when students were working in their groups, I walked around reading their responses. I talked to each student: acknowledging that I was also proud of their accomplishments, encouraging the students who just started going to Saturday School to continue to do so in the future, and nullifying any negative comments that students wrote on their sheets. I also was able to reiterate students goals for Unit 7, and encourage some students to reach a bit higher in their goal setting.